The gloaming is that fleeting, magical time just after sunset but before darkness. We hardly notice it in the summer because it stays light so late. But as the days get shorter, the gloaming’s nearly-night-time arrives ever earlier. Our bodies tell us that it’s time to hunker down for the evening. But our watches, sadly, tell us that it’s only half past four and our to-do lists point out politely that there’s no chance of slumping onto the sofa for at least another couple of hours. Which is why, at this time of year, Molly and I invariably find ourselves taking our evening walk in this odd half-light, when the daytime is over but the night-time proper hasn’t really kicked in. Now, you might argue that a moonlight stroll is a perfect, even rather romantic, end to the day. But when (a) it is cold, (b) it is muddy, (c) one of you is tired after a day’s work and (d) the other one of you is a nuts Labrador, romantic is not the first adjective that comes to mind. The views over the valley at this time of day, though, are pretty spectacular. Which is the main reason for this post. Because it has been raining here all day, but as the sun went down the rain stopped and we had a brief moment of calm as the moon rose in the sky and the world prepared itself for bed. As usual, though, I’d forgotten to take a proper camera so was forced to rely on my very rubbish camera phone. 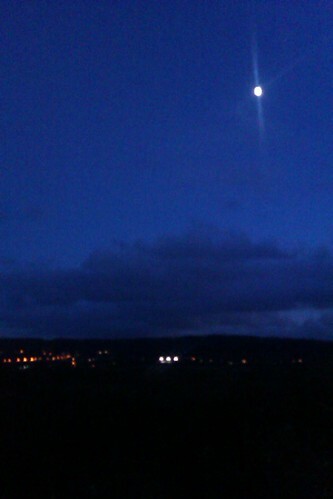 Anyway, here’s the moon over the valley. 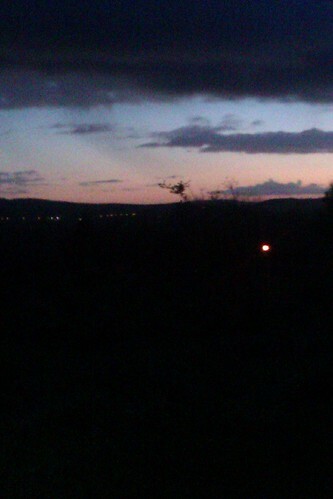 The three bright points of light in a little row are the floodlights at the football pitch in the next village along. Must be soccer practice tonight. Most of the other lights are street lights along the main road, with some houses mixed in. 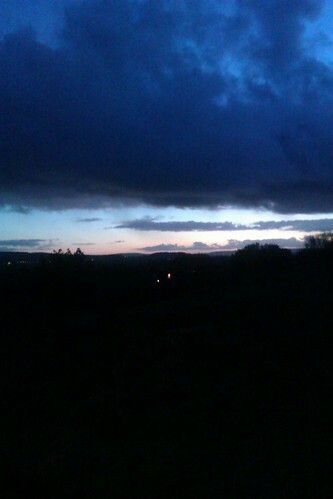 Here’s the view looking west, where you can see that the sun has only just gone down. You can see the lights from a couple of remote cottages in the valley below, but there’s not really much here between us and the sea. OK, so the zoom on my camera phone is fairly awful. But I just loved the colours in the sky; the way it goes from pink to blue so delicately, silhouetting the hills below and the clouds above. On our way home, we passed the local church and the porch light cast this welcoming glow across the graveyard. 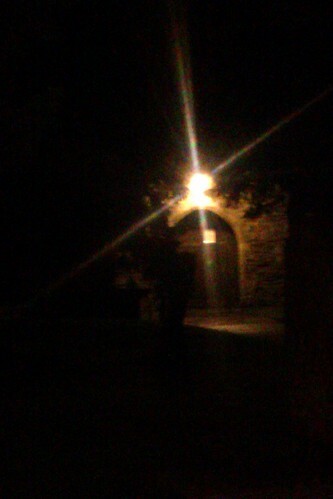 I know it’s wonky and blurred (the photo, not the church), but given that I was holding my camera phone and the end of the dog’s lead in the same hand, I’m just glad you can make out anything at all. And then, as quickly as it had arrived, the twilight of the gloaming was replaced by true darkness. In wintertime, this ephemeral period is most definitely my favourite time of day. Or is it night? Whatever. Here’s to the gloaming. This entry was posted in Dogs, Home, Life, Photography and tagged Dogs, Home, Life, Molly, Photography, Time, Walking, Winter by Simon Perks. Bookmark the permalink.